The recent merger between Gordon Boatworks and Hell’s Bay Boatworks paves the way for stronger customer service and eliminates unnecessary competition, said the leaders of these two shallow-water fishing companies. His business acumen and Tom Gordon’s boatbuilding expertise complemented each other well, said Chris Peterson of Hell’s Bay. “Overall, it was a perfect little marriage,” Peterson added. The merger also could be likened to a family reunion. Gordon once worked for Hell’s Bay, and brings with him two Hell’s Bay models he acquired when he started his own company four years ago. On the Hell’s Bay Web site, in bold letters just below side-by-side images of the two company logos, it says “Welcome Home” as it announces Gordon’s return to Hell’s Bay. 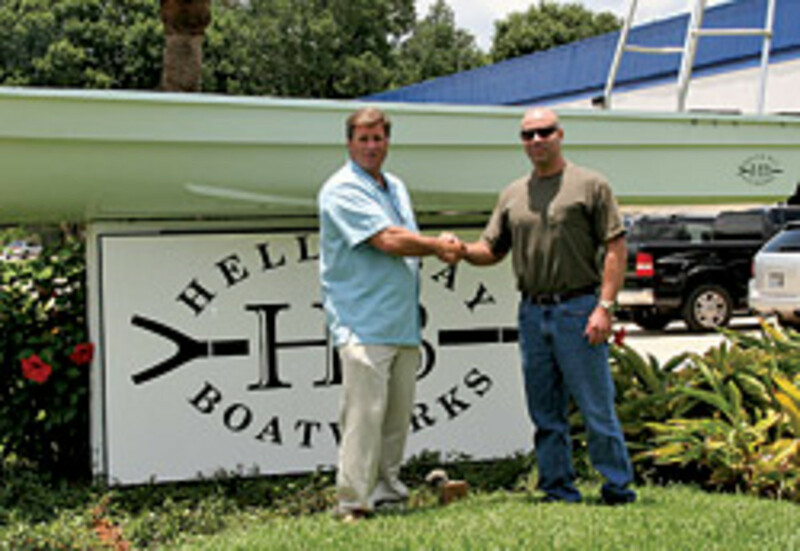 Based in Titusville, Fla., Hell’s Bay Boatworks was founded more than a decade ago by Florida fishing guides Hal Chittum and Flip Pallot, along with boat designer Chris Morejohn. The three had one goal in mind: to build the finest fishing boats ever conceived. But after several years of working together, the three decided to go in different directions and sold the company to a gentleman whose energy was not devoted to building up the company, according to Peterson. Hell’s Bay ultimately filed for Chapter 11 bankruptcy protection after the company’s primary financier received a $2.6 million judgment against Hell’s Bay for unpaid loans. Peterson ended up buying the assets through a bankruptcy auction late in 2006. Gordon, who was the plant manager at Hell’s Bay, left the company before it went into bankruptcy so he could start his own boatbuilding operation in Oak Hill, Fla. He has been in the fiberglass industry since 1989 and began his career in the shallow-water skiff market with Hell’s Bay in 1999. When he formed Gordon Boatworks, he licensed the two popular Waterman (16-foot and 18-foot) models from Hell’s Bay. “Both are very reliable fishing boats and proven designs,” said Peterson. Gordon Boatworks also worked with Pallot in launching a new design called the Ambush that has proven to be a popular seller. “Because he knew boats, the character of the people needed to build them, and because the product was so good, Tom became very successful,” Peterson added. As Gordon was working to make his fledgling boat company a success, Peterson was going through a personal crisis of his own — he was coping with terminal cancer. After a lifetime of starting up and running several types of businesses — a media company, real estate development, housing, plastics manufacturing and RV resorts — Peterson began divesting his financial holdings because he thought he only had a few months to live. He made several offers to the bank prior to and during the bankruptcy filing, but each time the bank turned him down because the offer was too low. Still, Peterson didn’t give up. He waited until the bankruptcy auction Dec. 1, 2006 and placed a bid for all the assets, including the physical plant, the molds, the intellectual property, “even the dust,” he quipped. He closed the deal in late December and immediately began rebuilding the company from the ground up. He said he hired back a number of former employees and worked out an arrangement with vendors to pay cash; most would not even take a cashier’s check from Hell’s Bay because they said they had gotten burned by the former owner, who they claim took deposits on boats that were never built. The former owner “defrauded approximately 32 sets of purchasers of boats, having accepted deposits for boats at times when he knew or should have known he would be unable to begin building the boats,” according to a joint disclosure statement filed in the bankruptcy case by Riverside National Bank of Florida and the committee of unsecured creditors. In an effort to rebuild trust in Hell’s Bay, Peterson said he honored up to $10,000 of deposits taken by the former owner. “We wanted to prove to vendors that we’re here for the long haul. We wanted to prove we’re here to do what we say we’re going to do,” he said. Hell’s Bay reopened its doors in early January 2007 and completed its first boat later that same month. “We’ve now resurrected it to its old prominence,” Peterson said. Some might think buying and rebuilding a company during the onset of a down economy comes with numerous challenges, but Peterson said the sluggish market has proven beneficial. “The slower economy is giving us the ability to really organize and get this business really in shape,” he said. Discussions of a possible merger between Hell’s Bay and Gordon Boatworks took place on and off for the last two years. Peterson and Gordon began talking more seriously about the idea three months ago. Given the distressed economy, Gordon said he and Peterson wanted to create one strong company. “It made sense for manufacturing, for employees, to bring it all under one company,” said Gordon. “With Hell’s Bay and Gordon Boatworks producing skiffs in separate facilities within 30 minutes of each other, it just makes a lot of sense to consolidate the operations into one company in one location,” said Peterson. All Gordon Boatworks models and intellectual property will be moving to the Hell’s Bay plant. Also making the move are Gordon and three of his nine employees — joining the 20 workers already at the Titusville plant. The company has one dealership in Texas, but most of the boats are sold directly. Gordon said there are no immediate plans to add more dealers. By incorporating the models of Gordon Boatworks, Hell’s Bay will now have 11 models of shallow-water skiffs in the 14- to 18-foot range. This includes the newest design from Hell’s Bay introduced in February at the Miami International Boat Show — an 18-foot skiff called the Boca Grande.